Preservation specialist Michael Burrey looks around an 18th century craftsman’s shop recently discovered on the grounds of the Berrybrook School in Duxbury. 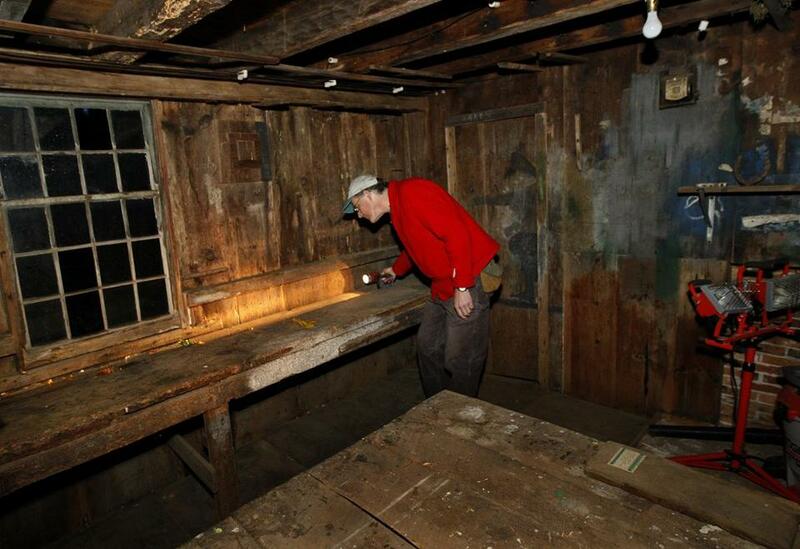 DUXBURY — What experts are calling “the rarest of the rare” and “a once in a lifetime find” — a largely intact woodworking shop dating from the latter half of the 18th century — has been discovered in Duxbury on the site of a private school for children. The 16-by-32-foot shed-like building is on the site of the Berrybrook School on Winter Street. With the school’s approval, restoration carpenter Michael Burrey of Plymouth explored the outbuilding, now clad in nondescript vinyl and used by the school for storage, while taking down an old house that once served as the preschool’s main building on the property. He said he was stunned by what he saw inside the building. 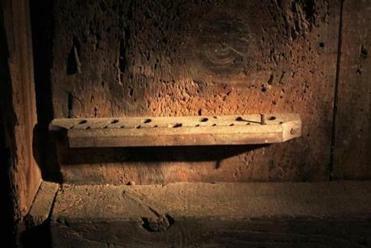 A drill bit bracket inside the 18th century craftsman's shop. “All the benches were there. It’s likely to be the earliest known joiner and cabinet maker’s shop on its original site” anywhere in the United States, Burrey said. “The woodwork on the house [being removed] was probably built in the shop. “The way the benches are in relation to the windows, how the light comes in to light an area, the location of the tool racks on the walls,” all tell of how the craftsmen used the shop, Burrey said. Gary Naylor of Hanson, a specialist in antique woodwork and tools, said the shop’s interior revealed signs of a Federalist craftsman’s workshop. The president of the school’s board of directors said Berrybrook had no idea of the building’s historical value. Since then the school has had more than a dozen experts come to see it, DeOrsay said. Burrey showed off the shop’s period-specific features to visitors on a recent afternoon. Framed in original sills, joists, and pineboard walls, the shop’s interior reveals two original work benches, one pitted with marks from hand tools. The second was a “planing bench,” lacking gouges or other tool scars because skilled millwork with wood planes was performed there. The wall above the bench has shelving to hold the planes. The planing bench also reveals a groove added later to allow craftsmen to install a treadle lathe for turning wood, powered by a foot pedal. The shop also has its original tool racks for chisels, awls, and brace (hand drill) bits, and a rack near the ceiling for handsaws. Holes in the wall board above the joinery bench and to the right of the window show where awls were stuck to keep them close at hand. Sketches and hash marks on another wall preserve the living sense of a place where woodworkers spend long hours. Someone painted a sketch of a man standing with his back against a wall, one knee lifted, a hand extended. Much of the outline remains, the colors dulled but visible. Sketches in pencil appear on another wall, including the outline of a bird probably sketched for a weather vane. Cross-hatchings over a door show the tallying of some quantity. Supplies? Boards? Wainscoting panels completed? Cuts in the wall board reveal the location and shape of the shop’s fireplace, probably removed in the 19th century in favor of a woodstove. Painted in black on a joist in the shop’s small storeroom, large digits spell out a date, “1789.” It may be a construction date, but Burrey says some construction techniques suggest an earlier date. Burrey also shows visitors a millworked “chimney surround” removed from the old house. He believes the house’s decorative moldings were done in the shop, probably by the house’s owner. Garrison, who visited the shop with a team of specialists from historical organizations such as Colonial Williamsburg, said the shop’s interior exhibited the pattern of work for woodworkers of the 18th century. Called “joiners” then (carpenters and cabinet-makers today), early American craftsmen worked with wood that came rough from the saw mill. Their first job was to plane it down to a smooth finish. You can see which bench is the planing bench not only because it’s not scarred but also because it’s built against the wall farthest from the fireplace, Garrison said. Planing produces shavings likely to become tinder for a spark from the fireplace, and would have been a threat to burn the shop down. Naylor said property records show that the shop belonged to a well-known “housewright and joiner,” Luther Sampson, in the late 18th century. Genealogy research revealed that Sampson was the craftsman who founded Kents Hill School in Readville, Maine. Born in 1760 in Duxbury, Sampson served in the Revolutionary War and bought the 60-acre Philips farm on the west side of Duxbury, home of the Berrybrook School today. His high-quality handiwork, experts say, adorns the interiors of many fine houses built in Duxbury in the late 18th century, when the town was home to prosperous sea captains and merchants. The survey team that visited the shop with Garrison last month concluded the building was worthy of National Historic Landmark status “due to its rarity and integrity,” Garrison said in an e-mail after the visit. He urged preservation of the shop. “We won’t get a do-over with this building,” he said. “While we have lots and lots of historical houses,” Garrison said in a recent interview, “as a woodworker’s shop it’s probably the oldest in New England” and possibly the country.